Nation of Islam Student Minister Nuri Muhammad will be the keynote speaker across seas at London South Bank University on Saturday, April 25 for a Youth Conference. The theme is "Our Youth: The Best Generation We Have Ever Produced. Can We Prove It? Yes We Can!" 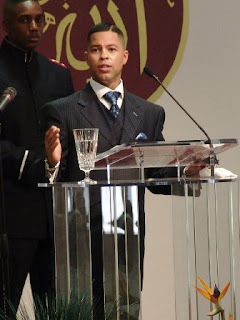 Brother Nuri is the Indianapolis Representative of the Honorable Minister Louis Farrakhan. This will be the first ever NOI webcast from the UK....don't miss this historic online event.